With TGS in full swing, Sony has been blowing it up with PlayStation Vita games. Konami announced Metal Gear Solid and Zone of the Enders and today Namco Bandai has announced on the PlayStation Blog a new Katamari game that is in development for Vita. 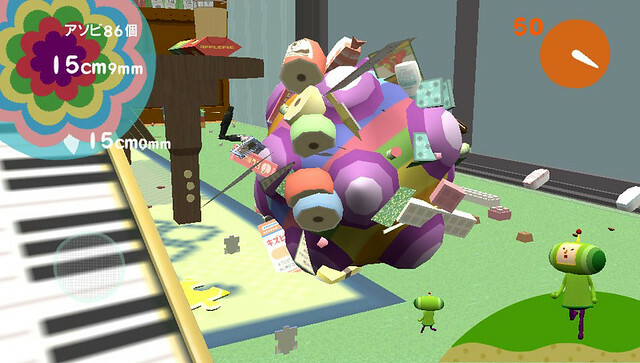 The game, using the working title of Katamari Damacy, will incorporate the rear touch pad on the PlayStation Vita allowing you to manipulate the Katamari to pick up objects from all over the game world. The touch pad will allow you to stretch and squeeze objects so you can roll them up. You can pick up objects ranging in size from little insects like ants to the majestic Mt. Fuji. Namco Bandai looks like it has a must have for Katamari fans.